A substance that helps a chemical reaction to occur is called a catalyst, and the molecules that catalyze biochemical reactions are called enzymes. Most enzymes are proteins and perform the critical task of lowering the activation energies of chemical reactions inside the cell. 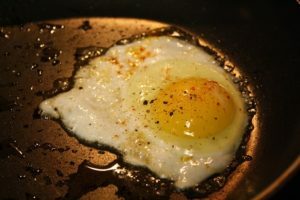 Most of the reactions critical to a living cell happen too slowly at normal temperatures to be of any use to the cell. Without enzymes to speed up these reactions, life could not persist. Enzymes do this by binding to the reactant molecules and holding them in such a way as to make the chemical bond-breaking and -forming processes take place more easily. It is important to remember that enzymes do not change whether a reaction is exergonic (spontaneous) or endergonic. This is because they do not change the free energy of the reactants or products. They only reduce the activation energy required for the reaction to go forward (Figure 7). In addition, an enzyme itself is unchanged by the reaction it catalyzes. Once one reaction has been catalyzed, the enzyme is able to participate in other reactions. 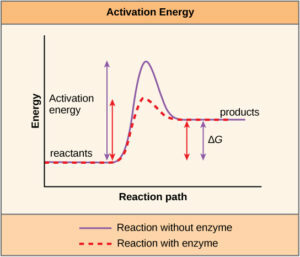 Figure 7 Enzymes lower the activation energy of the reaction but do not change the free energy of the reaction. Active sites are subject to influences of the local environment. Increasing the environmental temperature generally increases reaction rates, enzyme-catalyzed or otherwise. However, temperatures outside of an optimal range reduce the rate at which an enzyme catalyzes a reaction. Hot temperatures will eventually cause enzymes to denature, an irreversible change in the three-dimensional shape and therefore the function of the enzyme (Figure 8). Enzymes are also suited to function best within a certain pH and salt concentration range, and, as with temperature, extreme pH, and salt concentrations can cause enzymes to denature. For many years, scientists thought that enzyme-substrate binding took place in a simple “lock and key” fashion. This model asserted that the enzyme and substrate fit together perfectly in one instantaneous step. However, current research supports a model called induced fit (Figure 9). The induced-fit model expands on the lock-and-key model by describing a more dynamic binding between enzyme and substrate. As the enzyme and substrate come together, their interaction causes a mild shift in the enzyme’s structure that forms an ideal binding arrangement between enzyme and substrate. When an enzyme binds its substrate, an enzyme-substrate complex is formed. This complex lowers the activation energy of the reaction and promotes its rapid progression in one of multiple possible ways. On a basic level, enzymes promote chemical reactions that involve more than one substrate by bringing the substrates together in an optimal orientation for reaction. Enzymes promote the reaction of their substrates is by creating an optimal environment within the active site for the reaction to occur. The chemical properties that emerge from the particular arrangement of amino acid R groups (side chains) within an active site create the perfect environment for an enzyme’s specific substrates to react. The enzyme-substrate complex can also lower activation energy by compromising the bond structure so that it is easier to break. Finally, enzymes can also lower activation energies by taking part in the chemical reaction itself. In these cases, it is important to remember that the enzyme will always return to its original state by the completion of the reaction. One of the hallmark properties of enzymes is that they remain ultimately unchanged by the reactions they catalyze. After an enzyme has catalyzed a reaction, it releases its product(s) and can catalyze a new reaction. Figure 9 The induced-fit model is an adjustment to the lock-and-key model and explains how enzymes and substrates undergo dynamic modifications during the transition state to increase the affinity of the substrate for the active site. On the other hand, in noncompetitive inhibition, an inhibitor molecule binds to the enzyme in a location other than the active site, called an allosteric site, but still manages to block substrate binding to the active site. Some inhibitor molecules bind to enzymes in a location where their binding induces a conformational change that reduces the affinity of the enzyme for its substrate. This type of inhibition is called allosteric inhibition (Figure 10). Most allosterically regulated enzymes are made up of more than one polypeptide, meaning that they have more than one protein subunit. When an allosteric inhibitor binds to a region on an enzyme, all active sites on the protein subunits are changed slightly such that they bind their substrates with less efficiency. There are allosteric activators as well as inhibitors. Allosteric activators bind to locations on an enzyme away from the active site, inducing a conformational change that increases the affinity of the enzyme’s active site(s) for its substrate(s) (Figure 10). 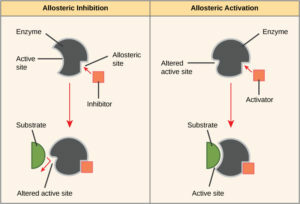 Figure 10 Allosteric inhibition works by indirectly inducing a conformational change to the active site such that the substrate no longer fits. In contrast, in allosteric activation, the activator molecule modifies the shape of the active site to allow a better fit of the substrate.